So, I went into "The Hunger Games" completely blind. That is not to say that I put on a blindfold and hid the world from view, rather it means I went in knowing absolutely nothing about the movie. I'd never read the book, or for that matter I had never even touched the book. I had seen exactly zero trailers, and done my best to avoid any exposure to discussions of the film online. Considering how much I am on Twitter and Facebook, that last one was a Herculean effort, that should earn me some kind of medal. Why did I go through such efforts? I wanted to go in completely fresh. No undue bias, no preconceived notions. Just giving the movie the opportunity to speak for itself, and tell me what I wanted to know. Since seeing the midnight showing, I have left the movie to stew in the back of my mind. And now, as I shiver violently with the joys of a post-convention plague, I will begin to lay out my thoughts. Stay tuned after the jump. So, as I stated I had absolutely no idea what to expect. I had briefly imagined in my head some strange movie about a fat camp, however, the strange flaming bird thing you see above killed that idea. Well, that and the fact that I couldn't ignore the fact that Jennifer Lawrence was in it. If Jonah Hill were attached, then I would definitely have considered the idea of it being a fat camp movie. Instead of a film about a fat camp, I was instead treated to a movie about a world where teenagers are encouraged to fight to the death in an annual contest for food, glory, and riches. So, in the end it is actually the complete opposite of fat camp, rather than trying to cut back on food, these kids want more. Kind of like Oliver, but quite a bit more violent. However, I assume that if you are anyone on this planet that ISN'T me, you're familiar with the story, and I can move on. The film has a certain grainy aesthetic that feels really appropriate for the majority of the first act. In the outlying "Districts" this gives the film a sort of grittiness that feels right. Coupled with the very subdued color pallet, that first section fits. Especially when compared to the much more colorful second act. 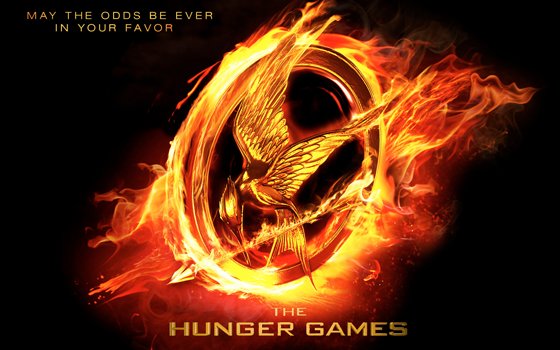 Once the film leaves "District 12" and moves on to the capital, things change dramatically. The color pallet becomes much more vibrant, in an almost "Wizard of Oz"-esque move. A move that I wholeheartedly approve of. And then giving up those vibrant colors as the combatants stepped into the arena. Simple moves that were very effective for setting the mood of the film. One thing that was jarring, and left me feeling a little on the queasy side, was some of the camera work. Once the chosen children entered the arena, and began to start their grand efforts to murder each other as violently as possible, the camera takes on all the charm and finesse of a person having a grand mal seizure while simultaneously being tossed around in what might be the worst car accident of all time. That is to say, that it shakes violently while being tossed around between random views, in a frenetic attempt to show action while depicting as little action and bloodshed as possible. It became quite clear that someone either did not know how to shoot an action scene, or that the scene was shot by some strange sadist that was deriving some sick pleasure from the discomfort of the viewers. And what is worse, anytime action scenes were depicted the same type of camera work came into play, which in a film based around a battle royale fight to the death, is not a good thing. Diverging from my displeasure with the camera work, I'd like to discuss the acting. As far as I am concerned, in a film that has such talent as Woody Harrelson and Elizabeth Banks, the acting in this film was pretty damned good. The characters played out well, and reacted appropriately to the situations that they were put into. Towards the beginning, I got a "Kristen Stewart" vibe from Jennifer Lawrence, but those fears were dashed the first time I saw her show fear. Once I realized she could show emotions and was not going to do a poker face throughout the film, I relaxed considerably. The movie was not particularly good at explaining itself, and I feel that one would have benefited greatly from knowing at least the basics of the story. I found myself somewhat confused as to what was happening for a while, and only began to really grasp the harsh realities of that world much later in the film than I think was good. The movie banks quite a bit on people being familiar with the story, and while I don't hold that against it, it did make the movie a little difficult to watch in the beginning. I'd recommend this film for sure if you are familiar with the books. The knowledge of the back story will help you appreciate the film as a whole. And might help you pick up on some intricacies that I just couldn't see due to having to pay too much attention to what was happening to really appreciate all of the fine details. Honestly? I think this is a big yes. The movie has a lot of cinematic elements that just won't translate to the small screen effectively. The movie itself is larger than life, and deserves to be seen as such. This is not to say it won't be fun on the eventual special edition Blu-Ray, this is just to say that It is going to play best on the movie screen. While not what I had envisioned at first, this movie packed quite a bit into the nearly 3 hour runtime. There are points where it drags on, but all in all I think the movie is well paced. I think it warrants a second viewing, perhaps... Just to make sure my initial thoughts jive with the reality of what the movie was.